Is it me, or have face masks had a serious revival? Before this year if you asked me what face masks (mask or masque? 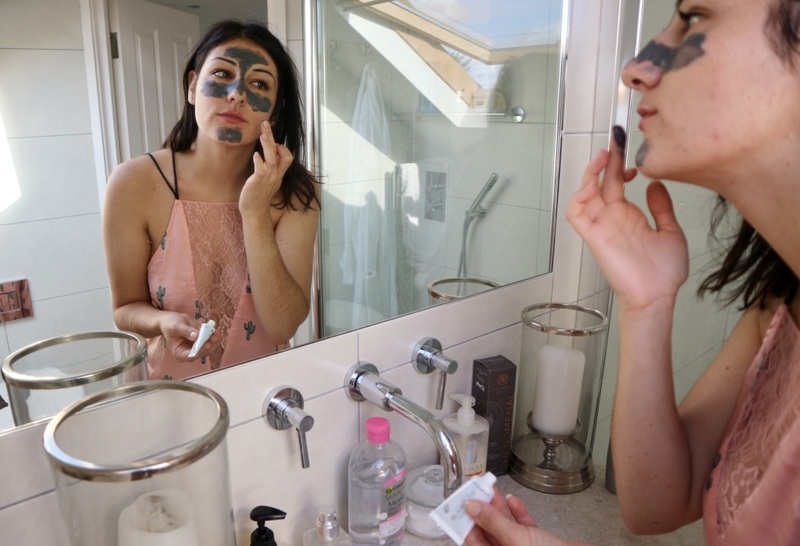 So unsure) I use, I would have to hark back to my secondary school days where we bought those 99p Cucumber Peel masks, or tried making our own from some teeny bopper magazine recipe. Fast forward to now and I tell you I'm ADDICTED to exploring new luxury masks and treatments, so when the GLAMGLOW team offered to send me a sweet little 10g sample of their SUPERMUD Clearing Treatment, I lapped it up. The most advanced clearing treatment developed by GLAMGLOW, SUPERMUD can be used by men and women for clear and poreless-looking skin. All you do is apply a thin layer to clean skin and leave on for 5-20 minutes depending on how much of a punch you want your skincare to pack. You can use SUPERMUD as a full face mask 1-3 times a week or as a spot treatment when a pesky blemish pops up. The first thing I noticed as I squeezed the mask on to my fingers for application, was the gorgeous Eucalyptus scent. I decided to apply SUPERMUD to my T-zone as any spots or blemishes tend to pop up there and I could feel it working. I have quite oily skin so I tend to feel any tingling or stinging VERY quickly with products that include Salicylic and Glycolic Acid. Make sure you always glance over the ingredients of anything you're putting on your skin and know your sensitivities. I felt the tingle straight away - I love a tingle - and as the product began to dry down, it subsided. The mask turns from a deep grey to a light clay-like colour and texture. Do a full face in SUPERMUD and try smiling. Go on, it'll be funny. I only used it on my T-Zone and chin and I think that must be what botox feels like. I could not move my face! I left the mask for 15 minutes and washed it away with a cleanser. It came off really easily and on first glance my skin looked flushed. Now, I'm no scientist, but I think there is a good shade of red after a skin treatment or mask, and post SUPERMUD my skin felt rosy, fresh and clean. Waking up the next morning I was chuffed. My skin had kept that flushness, it looked fuller and was perfectly clear. To look in the mirror I wouldn't have realised my pore's were reduced (who checks that really?) but after a cheeky google to say that thats what SUPERMUD does, I'd say yea, pores reduced, TICK! I LOVED GLAMGLOW SUPERMUD! I had no negatives, no dramas and nothing to complain about ; I really really loved this product. I've already skipped on over to Look Fantastic and ordered the GLAMGLOW Multi-Masking Kit which has 6 miniature masks from the full range to try. I'll make sure to let you know how I get on! If you're looking for a new pamper product then this is definitely one worthwhile treat ; luxurious, easy to use and really delivers. Have you tried any of the GLAMGLOW masks or treatments yet and have a recommendation for me? *Thank you to my beautiful friend Katie for her bathroom, bedroom and photography skills.